Maintainence of parasitaemia – is it to die for? One of the major differences between protozoan differentiation and metazoan differentiation is that protozoan cells normally retain potency during differentiation, which need not, therefore, be considered altruistic. Altruism does, however, arise at the level of the organism and consequently, protozoons have the potential to evolve altruistic traits. This is particularly true when, as with Trypanosoma brucei parasitaemias, populations are genetically homogeneous. This essay argues that whilst reports of altruistic phenomena during the trypanosome life cycle remain controversial, the prospect of reagents able to instigate pathways of cell death or differentiation bears further investigation. Metazoan differentiation differs from protozoan differentiation, not primarily mechanistically, since similar levels of mechanistic diversity are apparently seen within and between both groups , but rather functionally. Metazoan differentiation is essentially altruistic; billions of specialized cells are programmed to die and so are effectively sacrificed for the survival of a few gametes, which carry only half of the organism's DNA through to the next generation. When this altruism breaks down, as in the case of neoplasia, the resulting cellular proliferation is often lethal. In metazoans then, the well being of the organism is more important than the well being of individual cells. In order for parasites to be effective, equilibrium must exist between host and parasite. The death of the host prior to successful transmission would lead to parasite extinction. Likewise, extinction of all suitable hosts would lead to the extinction of the parasite. Parasites have therefore evolved to maintain chronic infections in order to avoid killing their hosts and maximise their transmission potential. Protozoan parasites have evolved mechanisms not only to avoid host defences, but also to avoid proliferating to such an extent that they kill their host. Trypanosomes replicate freely in the energy rich bloodstream of the host mammal but restrict their proliferation to a sublethal level to avoid killing the host and hence being killed. Whilst growing in the bloodstream of a mammalian host, the selfish aim of each trypanosome must be to maximise its chance of transmission before the death of its host. Each trypanosome therefore has two potential worthwhile fates, either continued proliferation within the host or transmission to a tsetse fly. Since stumpy forms are irreversibly arrested in the cell cycle, in the absence of being taken up by a tsetse fly they have a finite life span and will die. The longevity of a stumpy form has been estimated as about two days (and no more than three) from the time of cell cycle arrest . In accordance with this, a characteristic mosaic staining of the nucleus by DAPI staining can be observed in 1.2% of stumpy forms seen in 120 h post-infection of mice, a pattern reminiscent of the blebbing seen in apoptotic nuclei (Figure 1). Dying stumpy forms? 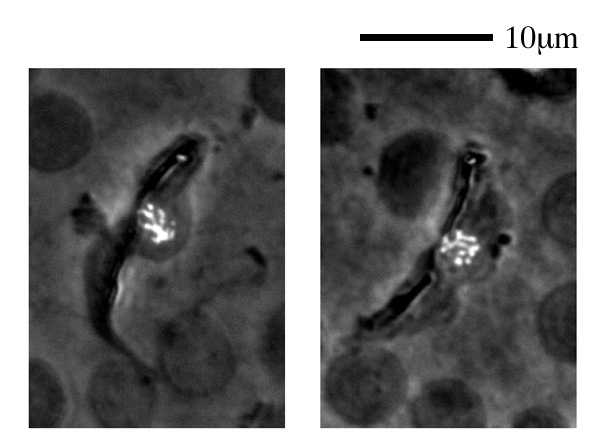 In bloodstream form populations taken from Balb/c mice at 120 h post-infection, approximately 1.2% (122 of 1000 trypanosomes counted) were stumpy by morphology and positive by diaphorase (a cytochemical marker of stumpy forms), but had a nuclear structure suggestive of a nuclear degradation. Such forms were not observed at earlier time-points during the parasitaemia. Slender form trypanosomes have evolved a density sensing mechanism, which informs the parasite that the infection is close to reaching a level which would kill the host and hence result in its own death. It is in the interest of each trypanosome that receives such information to exit the cell cycle. This is akin to a starvation response and can be viewed as a selfish act, since although the chances of being taken up by a tsetse fly are slim they are better than the chances of survival if the parasite continues to replicate. During the evolution of the T. brucei life cycle one can envisage an ancestral slender form would exit the cell cycle to avoid killing the host. Since trypanosome population density was maintained, within the limiting environment of the host bloodstream, there would be no chance for an arrested slender form to re-enter the cell cycle at a later point. This may explain the unidirectional unipotency of stumpy form differentiation. At high population density, in the mammalian host, an arrested slender form has only one possible productive fate – transmission to a tsetse-fly. From an evolutionary perspective it was, therefore, in the best interests of arrested forms to optimise their potential for transmission to and survival in the tsetse fly. This optimisation is reflected in the evolution of preadaptions, such as the partial activation of the mitochondrion seen in the stumpy form. The signal to differentiate from the slender form appears to be parasite derived, driving differentiation in a density dependent manner to the division arrested stumpy form. The longevity of a stumpy form is superficially quite a short period but it cannot be known whether stumpy longevity is of an artificially short duration. It may be that stumpy forms are programmed to die early and that this is directed towards removing stumpy trypanosomes in hosts that fail to mount an effective immune response in order to maintain a chronic parasitaemia. If this were the case, then abbreviation of the longevity of the division arrested stumpy form would appear to be an example of altruism, since it sacrifices individual transmission potential in the interests of maintaining a parasitaemia – (as is suggested by Seed and Wenck, this issue). Actually, the process shares features with two altruistic processes – terminal differentiation and programmed cell death . What distinguishes the slender to stumpy differentiation from both of these is that at the choice made by the parasite does not ensure the eventual death of the cell. On the contrary, the decision is a gamble with a huge payoff: – successful transmission to a parasite is the evolutionary equivalent of winning the lottery. As for someone spending his last dollar on the lottery (no how well the lottery monies are spent on the community) it is an intrinsically selfish, rather than altruistically motivated, act. The vast majority of bloodstream form trypanosomes are not transmitted but are removed by the host's immune response. A few slender forms, however, continue to divide. The heterotypes within these slender populations propagate a new wave of infection once the previous homotype has been eliminated, hence generating chronicity. At a population level, this system of maintaining a chronic parasitaemia is beneficial to all of the individual trypanosomes within it, but does it demonstrate altruism as has been previously proposed ? Although it is appealing to think that, because most of the population does not switch to avoid the immune system, an altruistic (though passive) mechanism is in play here, this may not be the case. There is currently no reason to believe that switching occurs as a result of parasite "choice". The VSG switching rate has not been linked to environmental change or stimulus, rather switching appears to be a stochastic phenomenon and the rate of switching appears to be an intrinsic function of slender form cell growth. For this reason there is no decision by parasites to sacrifice for the greater good, making "not switching", a dubious candidate for an example of protozoan altruism. In the tsetse midgut the procyclic population is also limited to a level which is sublethal to the tsetse fly and relatively constant, even after a blood meal when nutrients are not limiting . It has been suggested that this is achieved not just by cell cycle arrest, but actually by activation of a programmed cell death pathway which is akin to apoptosis in metazoans. Evidence has been presented which focuses on characteristic blebbing of the nucleus and on the production of the characteristic apoptotic "ladder" of DNA fragments obtained when DNA of these dying forms is purified and run on agarose gels . These reports have understandably been met with a degree of caution. Even in the confined environment of the tsetse midgut, the establishment of equilibrium between proliferative forms, arrested forms and natural elimination of cells would suffice. From an evolutionary perspective, the necessity for a mechanism in which excess cells are produced initially, and then a proportion of the population sacrificed for the greater good is not apparent. It is not yet clear whether all procyclic forms that arrest in the tsetse midgut become potentially invasive proventricular forms. Once the tsetse salivary gland has been colonised the existence of the remaining procyclic trypanosomes in the midgut is apparently futile. From the evolutionary perspective of the trypanosome population, once the salivary gland is colonized the midgut infection would ideally be eliminated, promoting fly longevity. This is a level of altruism that clearly has not evolved. Procyclic forms that have arrested at high density and cannot invade the salivary gland must eventually die (not suicide since they would presumably initiate a salivary gland infection if they had the chance). It is likely that as this occurs, the nucleus fragments and it is possible that this is seen as blebbing, moreover, the fragmented DNA may, when purified, show a "ladder" effect on an agarose gel. Although these phenomena are taken as characteristic of apoptosis in metazoans, in evolutionarily disparate kinetoplastids, they may just be characteristic of a more generic trypanosome cell death . The activation of two major pathways are considered an integral part of apoptosis: – 1) the proteolytic activation of caspases and 2) mitochondrial membrane permeablization via the BAX/BCL-2 pathway. Recently, evidence of BCL-2 homologues and of conservation of this pathway in yeast has been presented : over-expression of heterologous BCL-2 leading to yeast cell death in a manner akin, but not identical, to apoptosis of mammalian cells . The implications of this work support a universally conserved programmed cell death mechanism. It can be speculated that the reason for activation of such a mechanism would not be starvation (yeast cells arrest growth when this occurs), rather this may represent defence against spread of a pathogen (typically a virus) which might otherwise wipe out a yeast colony. Such a mechanism may even extend to prokaryotes . If this turns out to be the case, such a mechanism is truly altruistic. The possibility of a cell death pathway in trypanosomatids is clearly relevant therapeutically if it can be triggered externally. It is still not clear whether BAX/BCL-2 or caspase homologs do exist in trypanosomes. Recent papers have hinted that the BAX pathway may be at least partially intact in leishmania  while calcium mediated cell death can occur in trypanosomes , further a group of caspase-like molecules the "metacaspases" have been linked to cell death in trypanosomes . Nevertheless, clearly defined cell death pathways in trypanosomes have yet to emerge. Genomic and proteomic analysis should lead to the elucidation of any evolutionarily conserved programmed cell death pathway in the next few years. Thus far though, clearly homologous machineries have not emerged from those protozoan genome projects, (including the trypanosome and leishmania genome projects), which are essentially complete. This essay was largely drawn from an essay in my PhD thesis, which was BBS funded and supervised by Keith Gull and Keith Matthews. Thanks to them and to Patrick Tyler for contributing comments in the preparation of this editorial.